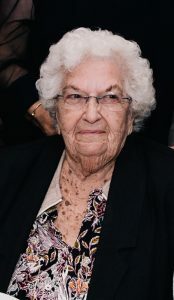 Ruth V. (DeBettencourt) Metell, 93, of Oak Bluffs, died peacefully surrounded by her loving family on Feb. 8, 2019. She was the beloved wife of the late Alfred M. Metell, and daughter of John and Marion DeBettencourt. Ruth graduated from Martha’s Vineyard Public Schools. She married Alfred Metell on Oct. 12, 1946, and they moved to New York for some time before ultimately settling back in her hometown in Martha’s Vineyard. After raising her five wonderful children, she worked her first retail job at the Ben Franklin Five & Dime in Vineyard Haven. Later she started a career as a bookkeeper and sales clerk at G and B Clothing in Oak Bluffs. She then went on to work at the Martha’s Vineyard and Edgartown banks. Her most beloved job of all was working as a hostess at the Boston House in Oak Bluffs when it was operated by Tubby Rebello. Ruth was an active member of the Portuguese-American Club since she was 18. She was recognized at the State House in the 28th annual Heritage Day of Portugal celebration for her outstanding contributions to the community and being a role model. Ruth was also a member of Our Lady Star of the Sea Church Guild, where she received the Marian Medal from the archdiocese. As someone who loved her community, Ruth enjoyed being around people, and was a dedicated volunteer. She adored helping at the Possible Dreams Auction. Always willing to help others, she volunteered at the Oak Bluffs Senior Center, and in 2010 received Volunteer of the Year award from the Oak Bluffs Council on Aging. Aside from her witty persona, she was a caring and loving person who loved to make people laugh. Some of her best laughs were made while participating on a co-ed bowling team called Priceless, where she received the Team Sportsmanship award. Most of all, she loved to have a good time anywhere she went, especially with her family. She was a loving mother, grandmother, and great-grandmother, and will be dearly missed by all who knew her. Ruth is survived by five children, Claudia A. Metell of Oak Bluffs, David Metell and wife Carla of Melrose, Coleen A. Westover and husband Dr. Gerald Westover of Edgartown, Carol A. Packer and husband David of Centerville, Corey A. McGaughey and husband Patrick of Sandwich; two sisters, Gaynell Downs and Brenda Frederick; four grandchildren, Sally, Jeffrey, Anthony, and Christopher; six great-grandchildren, Andrew, Lucas, Ava, Anthony, and the twins Maya and Tyler; and many nieces and nephews. A visitation will be held at the Chapman, Cole and Gleason Funeral Home, 56 Edgartown–Vineyard Haven Rd., Oak Bluffs, on Thursday, Feb. 14, 2019, from 4 to 7 pm. A funeral Mass will be celebrated at St. Augustine’s Church in Vineyard Haven on Friday, Feb. 15, at 10 am. Burial will follow in Sacred Heart Cemetery in Oak Bluffs. In lieu of flowers, donations may be made to the Hospice of Martha’s Vineyard, or to a charity of one’s choice. For online guestbook and directions, please visit ccgfuneralhome.com.